All our paintings are 100% hand painted by our artists from sketch to finish, step by step. 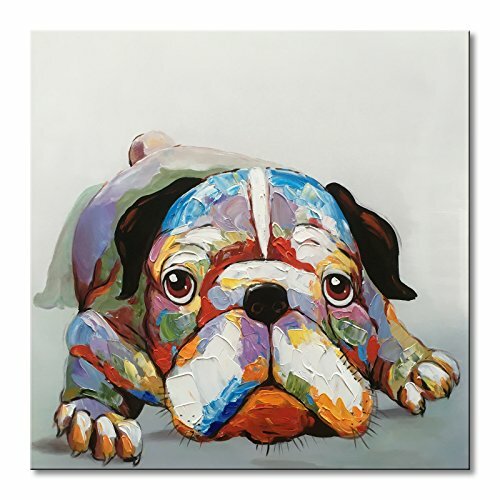 This animal of dog canvas wall art are very popular in decoration market. We as art factory with thousands of decorative oil paintings including modern art, contemporary art, abstract art, animal art, famous art, pop art and so on, to satisfy all of your fine art needs. Size by 32"Wx32"H, 1 panel / a set. Hand Painted oil or acrylic painting on canvas by our professional artist. You can see the raised paint and brush strokes. This handmade cute animal of dog artwork suitable for home decor. Framed : Gallery Wrapped and Stretched on strong wooden frame, Ready to Hang. Each panel has a black hook already mounted on the wooden bar for easy hanging, edges are painted. A great gift for your family, friends and relatives. It is a perfect wall decoration picture for living room, bedroom, kid's room, kitchen, office, hotel, dining room, restaurant, porch or public place etc. Custom size and color are welcome. The image is just for displaying not for scale, please measure your place before purchase. This texture animal art picture will light up any room. Ombura Hipster Deer - Deer in Vest and Glasses Dictionary Wall Art Print. 8x10 Home Wall Décor. Ideal, Unique Artwork for Men, Women and Teens for Any Animal Art Lover. Frame Not Incl. Quedom Canvas Print Wall Art Painting for Children Room with Black Frame Decorative Artwork Animal Series_The Giraffe Blowing Bubble Gum_Brown and White_12" x 16"